The favorable year of the Lord! “He came to His own, and those who were His own did not receive Him.” (John 1:11). – This is certainly the case in this incident. – “Where He had been brought up,” we read in v.16. But does not this disagree with the Word of God otherwise? Does not it say in John 1 further on that “His own did not receive Him?” And does not Jesus say this which has become a known saying among people: “No prophet is welcome in his hometown.” (Luke 4:24). Yes, just wait and see. But first we go to this occurrence in the synagogue at His home place, and the message that He taught them. Just think, there was Jesus coming – as it says here: “And He came to Nazareth, where He had been brought up.” (v.16a). – They were on His heart, these people. – He had wandered among them, He had seen their frailty’s, the ones inclination to irascibility and temper – quick to shed blood, as it is called about those kind of people – the others impure looks after the women who passed them, the third’s irascibility to gossip and slandering etc., and now He came to them, “the Lamb of God who takes away the sin of the world!” (John 1:29). Notice here that He knows all people like this – also you! He also knows your sin and frailty – He knows you inside and out, and He comes to you, also at this time, mentions your name, and says: “I know you!” All things are open and lay bare to the eyes of Him with whom we have to do. (Heb. 4:13). But isn’t this scary? Yes, to the one who shows God their back and wants to live out their sinful nature, for those it is highly scary. As Abel’s blood shouted to heaven, over the misdeed that was done, your sins shout too, through those you have hit. The one you have gossiped about for example – what has hit the person concerned through this sin of yours, shouts to God over this misdeed. This is how all sin hangs over and follows a person all the way to the gate of eternity – yes, also in there. Scary? Yes! But the one who has come to Him, the Lamb of God, there is a joy the world does not know of. Just the fact that I am known by Him – that nothing is hidden, is in itself a loud shouting proof that He surrounds Himself with sinners, pleads their case and executes justice for them. (Mika 7:9). Just listen to the testimony about the Jews in Nazareth: They were “wondering at the gracious words which were falling from His lips.” (v.22a). Yes, they were wondering exactly over the gracious words! That was not what He had come to preach about in the synagogue today. He could not speak about that word: “Today this Scripture has been fulfilled in your hearing.” (v.21b). No, now the year of grace had come from the Lord - the favorable year. (v.19). This year has still not ended – still these words of Jesus can be heard from the synagogue in Nazareth, that is highly topical words for you. Now is the year of grace, now God can be found – for the sinners! Sinners of all kind. 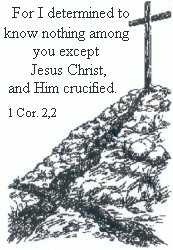 The deepest fallen ones, as the world looks at it, and also those who have offended God in the most horrible way, with the self righteous and self produced piety they have put in front of Him, as a savior foundation - the incredible mocking towards the Gospel, the crucified Christ that this contain of. Come now and find peace with God and the beatitude, while it is still called today, while it is still called the year of grace from the Lord! But it looks like too that the people received this word about God’s goodness towards people. Yes, indeed they did – and there is a lot of this kind of people today too – a God who helps the miserable will few despise. But Jesus plants a “seed” here in His speech, which exactly reveals many hearts thoughts – what really lives there – as He says: “Today this Scripture has been fulfilled in your hearing.” (v.21b). It bear fruit in its time – and as we can see, if we read further here in this passage in Luke – pretty soon. In the middle of their joy and astonishment over the message of grace from God, something is “grating”. What is it? – It does not dawn on them right away, but pretty soon it comes clearer to them: What is He saying really? Is He really saying that this scripture is fulfilled by Him? Have you ever planted a seed? – Then you go there and wait that it will show any results of what you did? If we speak of a child, it runs to the garden several times a day to look. And one day you see – isn’t it something small and white that breaks the surface? One cannot be certain that it is the plant yet, but it does not take too long before you know – that you recognize it now. You can see in the middle of this fine and obviously fertile earth in the synagogue in Nazareth that is presented like this: “And all were speaking well of Him, and wondering at the gracious words which were falling from His lips” (v.22a), then a little germinal sprouts up: “Is this not Joseph’s son?” (v.22). Do you see? – There, in the middle of the blessed meeting you eye the ugly and deadly plant – disbelief. Only a little germinal is showing now in the beginning. A little question is formed out from what happens in the foundation of the heart. Oh yes, the message about God’s goodness and grace etc. these God fearing people could receive with joy, but that this was attached to Jesus person alone, that was too bulky food for them. It should be fulfilled in them – because they were – not only Jews, but pious and God fearing Jews. It had to do something with their godliness, something to do with their spirituality, in their services, in their penance and whatever they could think of. They were not just going to have a Lamb of God to put their trust in! What about us? – What do we hope for? How deep are we going into it? Is it the Lamb of God alone that you have your hope in? Jesus certainly experienced – He saw – this plant sprout up in the middle of the congregation, and He kept on with them and taught them the Word of God’s truth, that His grace was not attached to what they were. Then He show to the examples with the famine in Elijah’s time, when the Lord helped the widower in Sarepta in the land of Sidon, while He did not help any Jews. – He shows to the many leprous people in Israel in the time of Elijah, and that God did not heal any of them, only the Syrian Na’aman. This word of truth – they had it written down in their own holy Scriptures – they could just look for it themselves. But now the atmosphere changed – and why? Because He said that God no longer was as gracious towards them as He had previous preached? – Had He presented a different God to them? No, but because He was not gracious in the way that they meant He should be! Then they were revealed as God’s true enemies, in the middle of their god fearing. They probably would’ve been sitting there in the synagogue today, and been thinking about those and those who weren’t there, who should’ve been there, but who was not as pious and god fearing as they were and so on. And then we read, when we really get to meet God’s Word – God’s message: “And all the people in the synagogue were filled with rage as they heard these things.” (v.28). Again, why? – Was it because the truth was not preached? – No, but exactly that was the reason! It was not like they wanted it. They would not come down from the pedestal they had sat themselves on, and that they enjoyed so much. – They would not “become one among the crowd of sinners who just know how to thank and praise!” as C.O. Rosenius expresses it. Do you? Do you have any privilege to show to? – Something more than that you are a sinner saved by grace? Listen to how this meeting – which started so good – ended. And keep in mind that the cause was the true teaching: “And they got up and drove Him out of the city, and led Him to the brow of the hill on which their city had been built, in order to throw Him down the cliff. But passing through their midst, He went His way.” (v.29-30). We shall not dwell on this rage, and this lust to murder that we see in this “godly” flock, but put it on our hearts and mind how it goes where the Word of God becomes resisted and not received: “But passing through their midst, He went His way.” Away! Away from them! The rescue that came to them, full of grace and truth - full of compassion towards their sins and frailty’s – full of savior desire – it went away! And it goes away today too! Keep that in mind when you go to listen to the Word of God.